If you have FourFinders on your computer, you most probably have installed this application accidentally. It is an adware program classified as potentially unwanted application because it is able to expose users to corrupted websites. Some users think that FourFinders is a dangerous computer virus, but that is also not true. It is an adware application that has been developed in order to generate financial revenue for its creators. You must remove FourFinders if you want to protect your computer from potential exploitations. Adware programs are not safe, and they cannot remain on your system. FourFinders is one of the many applications from SuperWeb group. This family of potentially unwanted applications includes such notorious apps as Hatchiho, NewCrawl, Gooternet and many others. The truth is that FourFinders is identical to all of its predecessors. They even have similar homepages that make an impression the programs are reliable (which is not). The website for FourFinders is located at fourfinders.net, and it says that this application can improve your web browsing experience. It also says that FourFinders offers extensions compatible with Mozilla Firefox, Google Chrome and Internet Explorer. However, that is not exactly true because the newest versions of Google Chrome block FourFinders, stating that this extension is not listed on Chrome web store, and so it cannot be trusted. What is more, it is impossible to download FourFinders at the official website. Dead direct download links are very common among SuperWeb applications. It also means that you download and install FourFinders together with other potentially unwanted applications. It is hard to say exactly when or how this app arrives at your computer, but it happens quite often when users download freeware apps from third-party websites. They are also commonly included in fake flash player setups. Ads for fake plash player or media player update pop up all the time at adware-supported websites. With FourFinders on your computer, you will not be able to browse the Internet properly. You will be constantly bombarded with commercial advertisements and various pop-ups. FourFinders will also collect your search terms, information on visited websites and even all input data information. Although you technically agree to it when you install FourFinders on your PC, since the application enters the system silently, it is an obvious privacy violation. On top of that, FourFinders might even share the collected data with unreliable third parties for monetary purposes. It is clear that you should not tolerate this application any longer. 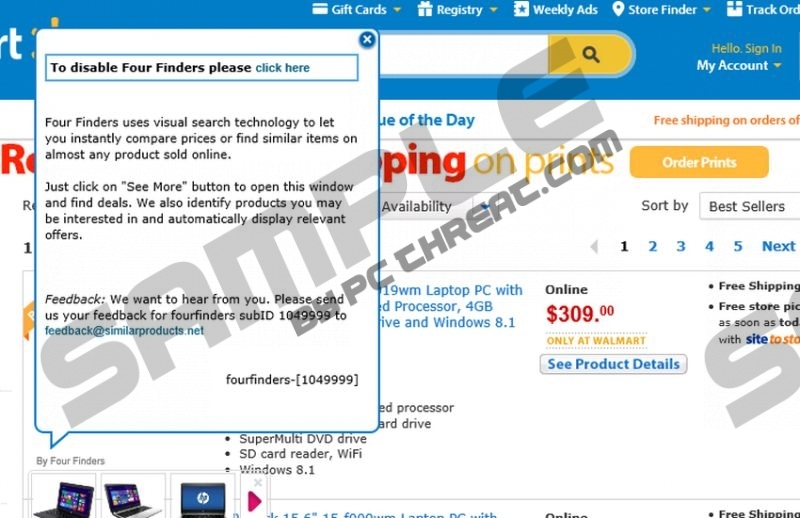 Uninstall FourFinders right now, and then scan the PC with SpyHunter free scanner. You need to check whether there are any additional unwanted applications on board. After a thorough system scan, acquire licensed antispyware application that would safeguard your system against similar threats in the future. Select Uninstall a program and remove FourFinders. Open Uninstall a program and remove FourFinders. Press Windows key and select Control panel. Open Add or remove programs and uninstall FourFinders. Should you have any further questions, you can always leave us a comment below in the comment box. Quick & tested solution for FourFinders removal.